This is the conclusion to the Perfect Switching article. Again, let me warn you that this page assumes you know a little bit of electrical wiring and reading basic schematic diagrams. If you don’t know what “parallel” or “series” wiring means, this page will provide you with some basics: http://www.1728.com/guitar.htm. Last week, I showed you alternative pickup switching possibilities that can give you a wider range of tones to choose from. We’ve come a long way from the paltry 3-way switch of the Les Paul, to the Strat’s 5-way switch, then the Red Special’s 7 combination switching using 3 switches (not including phase-switching), we have 13 combination switching using 4 switches. This week, we will conclude this series with some more ideas. Whether we incorporate these additional ideas or not is subject to deliberation. On one hand, we want to squeeze as much juice as we can from our pickups. On the other hand, we do not want to end up with a guitar that looks like a 60s era rocket ship cockpit. You may use either single or double coils (humbucking). Cycfi Alpha uses DiMarzio Area 67 pickups which are actually noise canceling double coils voiced after the bright and very clean Fender Strat 67. I am not quite fond of noisy single coil pickups. For double coils, coil tapping and series-parallel wiring of its coils offer additional tonal variations. Coil tapping involves switching off one of the coils giving you single coil capability. That makes the pickup very susceptible to noise, so that’s out of the question. It may be nice to have each humbucking pickup have its own series-parallel switch though. The circuit will be like what we have (see Basic Building Block in part 2 of this article) except that the SW2 is not needed and is hard-wired for the 2 pickup setting. Food for thought. 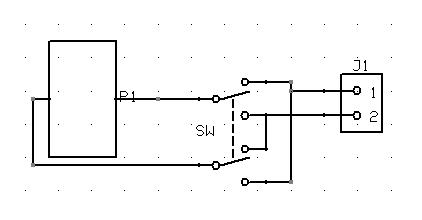 When two or more pickups are connected and one pickup is reverse-wired, the signal of the reverse-wired pickup is out of phase and cancels out certain frequencies. The result is a thinner, squawky sound with a dramatic decrease in volume. You need a DPDT switch to reverse-wire a pickup. For a 3-pickup setup, you only need 2 switches, not 3. You only need to provide phase-switching for the neck and bridge pickups. The first part of this article explains why: 3 phase-switches give you redundant configurations and you can get the same results with only two switches. I have mixed feelings with phase switching. As-is, I find it barely useful only in very special cases. However, it might be interesting to limit its effect by incorporating a potentiometer that will act as a pickup blend control. When all pickups are in-phase, the blend controls will be additive (boost). When a pickup is reverse-wired, its blend control will be subtractive (cut). Usability matters. No matter how impressive a feature is, bottom line, it will not gain traction if it is difficult to use. The use of multiple switches makes it a bit more complex to use. It may be argued that beauty of the Strat or the Les Paul lie in their inherent simplicity. That may be true. As Einsten said, “keep it as simple as possible, but not simpler”. With the tried and true, you can’t go wrong. It’s simple and effective. However, by going the same path over and over again, we fail to explore unseen possibilities and ultimately, it becomes boring. Multiple switches may be tricky to use at first, especially when you are accustomed to the single multi-position switch. However, I don’t think this should be a problem with the modern guitarist with his/her full arsenal of gadgets. Hey, guitarists do a lot more complicated finger gymnastics! Guitarists I know love to experiment and explore. SW2 controls whether we combine A and whatever the setting of SW4 is (mono B or C or duo B and C). Assuming SW2 and SW4 are in mono, the other 2 switches (SW1 and SW3) control pickup selection. SW1: switches A or whatever we chose with SW3 (B or C). Think of it as the “lead” switch. If A is the bridge pickup, flicking SW1 will always give you the bridge pickup. The Cycfi guitar will have an on-board microcontroller (embedded microprocessor). We can incorporate an even more smarter and more user friendly switching scheme. Under the hood, we will be using low-power latching relays for each of the switches and have these relays under the microcontroller’s control. I’m pretty sure that previous statement will raise more questions. We’ll get to that soon. Cya! Hi Greg. Hum is not a problem with light to moderate gain. Hum starts to be a problem when you have really heavy gain (e.g. heavy-metal). People use noise gates to manage the noise, but the sustain suffers in the process. We can wire a guitar to be fully differential by floating the ground. This blog explains how: http://naiant.com/about/guitarwiring.html. Without the transformer, this will require an balanced input stage which (alas) typical guitar amps do not have. Another option is to use an opamp wired as a differential amplifier right inside the guitar. I had good luck with a humbucking pickup with split coils. I wired one coil out of phase, routed through the existing tone control. That is, through a capacitor and potentiometer. With the pot down I got a solid single-coil tone. With the pot up many of the higher frequencies got cancelled, giving a dark bass tone with a sparkle of uncancelled frequencies on top. I don't find single-coil pickups to be that much trouble. In a performance context any hum is way below the overall volume level, and a decent studio should be properly wired and grounded. And I think you once explained to me how to use an op-amp to cancel hum?